The Art of Danny Beck: Hello, Library Card, it's been a long time. Hello, Library Card, it's been a long time. One of the recommendations for us new to illustration is that we spend some time at the library, looking at the kind of books we want to write. So I did just that... after spending some time writing a story for my hamsters and monsters, I ventured over to the Santa Clarita public library. Libraries haven't changed much since high school... when I last stepped inside the Tempe Public Library. Computers were making their debut when I last visited and now they are in full effect. I wandered over to the children's section and there I was, faced with thousands of options. But, how do I distill this all down and find books that are quirky, unusual and strange? The kind of books that have a weird send of humor don't just jump out at you... they're buried between the books of trips to the zoo and books about firemen. After attending the SCBWI conference in LA I got derailed yet again. Standing there, amidst a sea of artists with sweet and warm pictures of animals and children, clutching my "dummy" book of monsters and hamsters with a worried look on my face. Do I belong here? I can do the traditional illustration stuff but I wanna do my style... I want to explore a world of colorful monsters and helpful hamsters! This is a book that I would've loved to have read as a kid and that's enough for me to keep going... knowing that out there, somewhere, is another version of me in kid form waiting to experience monsters and hamsters and their silly interactions. Maybe there's more than one kid out there that would get a chuckle out of it... maybe there's a hundred! I'd be happy with a hundred kids liking my book. That's enough for me to keep going. Illustrating this is the easy part... writing is a whole other cookie. I am going to be signing up for an illustration class at Art Center that starts in October. Hopefully that will help focus my goals a little more... but in the meantime I will be writing and drawing, drawing and writing, waiting for it to just click. 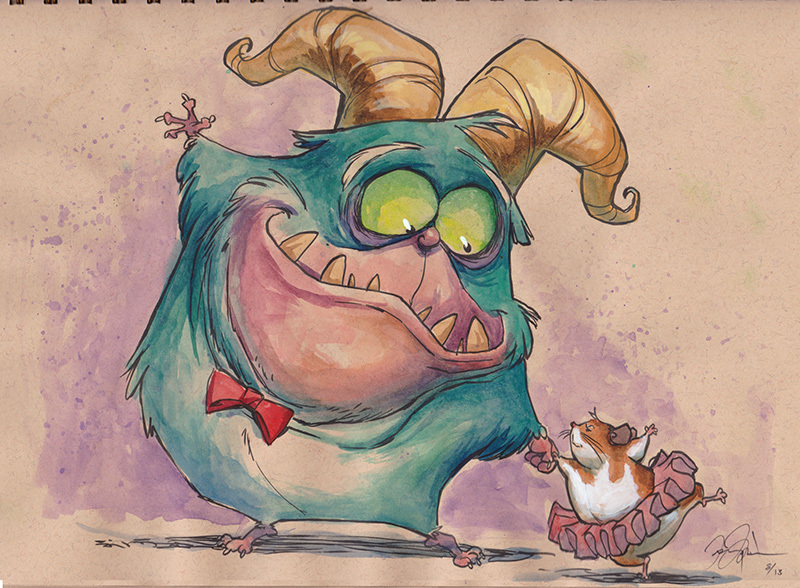 Here's a hamster dancing with a monster! What a whirl! What a whirl!